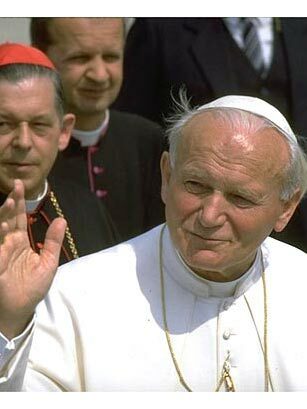 Pope John Paul II was born Karol Jozef Wojtyla in Wadowice, Poland. When elected by the Catholic Church in 1978, he became the first non-Italian pope in 455 years. Studying for the priesthood in an underground seminary in occupied Poland, he was ordained in 1946 and received his Ph.D. in philosophy from the Pontifical Angelicum University in Rome. This pope has modernized the papacy and internationally spread his reach in massive gatherings of Catholics and frequent consultations with heads of state. Despite his modern role, his rule has not been without controversy. His declaration that women may not serve as priests and his attempt to apologize for historic prejudices and injustices by the Catholic Church received virulent criticism. In naming him its Man of the Year for 1994, TIME said, "His power rests in the word, not the sword... He is an army of one, and his empire is both as ethereal and as ubiquitous as the soul."